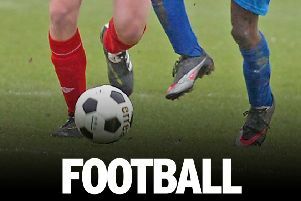 Alnwick Town overcame First Division side Newcastle East End to progress in the Northern Alliance League Cup on Saturday with a 4-0 victory at St James’ Park. Newcastle East End arrived at St James’ Park without a win this season, so on paper it looked to be an easy home win on the cards, but over the 90 minutes it was anything but. It was a scrappy start for the home side against the visitors, who should have taken the lead in the second minute. A cross was allowed through into the six yard box, but somehow Max Bell managed to hit the post from only a couple of yards out, only to see the ball go into keeper Brooks’ arms. This was a real let off for the home side. His efforts weren’t in vain though, as he can also supply the chances for others. It was his through ball to Cunningham in the 16th minute that broke the deadlock, Cunningham with the simplest of finishes around the keeper to finally break down the away defence. The home side were pressing, and two goals in two minutes all but sealed the cup tie. McClelland finally got his rewards in the 25th minute from close range after beating three defenders, and Jonathan Quinn struck a goal of the season contender from distance, looping over the keeper into the far corner. It was a cracking effort, making it 3-0 to the home side at half time. 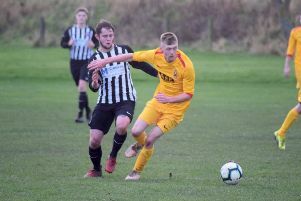 In the second half there were further chances for McClelland, with his second goal eventually coming in the 58th minute, and a well hit volley from debutant Eastlake’s cross (4-0). Both sides created further chances, Alnwick going closest through Quinn in the dying moments.